Hello….I saw your web page and have a question. 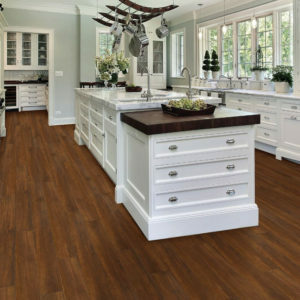 I have a bluish-gray vinyl flooring running thru my house…I can’t afford to replace it (there’s nothing wrong with it), but I would like to change the color to a “tannish” color…can I stain it? Rita, stain isn’t a good idea for a vinyl floor, but paint can work wonders! If your floor is well secured and free of dents, rips and deep scratches then paint can be a great choice to give an old vinyl floor a new life. First thing you would want to do is use TSP or a floor stripper to remove the wax buildup, gloss coating or protective layer of the vinyl flooring itself. Some websites recommend sanding the vinyl before applying a primer, but that is not necessary. Not to mention that if it is an old floor you run the risk of releasing asbestos into the air. So avoid sanding the floor. Once the flooring is dry, apply a good primer. I suggest using Gripper by Glidden or another good gripping primer. Use a paint brush to cut in around the base boards and cabinets. Then use a paint roller with an extended handle (this will keep you off the ground and keep bending to a minimum). Let the primer dry thoroughly and then repeat the process with your base color. Depending on the coverage you may need to do a second or third coat of your base paint color. If your old flooring had a pattern, like tile work and you want to keep it, using a second color fill trace the grout lines. If you want to create another pattern, use a stencil to add character to your new painted vinyl flooring. Popular patterns on painted vinyl floors are tile patterns, the brick look, wood floor look, or use a stencil to create a border. Really at this point your imagination can be your guide. Once you’ve got the base coat and pattern down, seal the paint. Use a polyurethane and coat the entire floor a 2-3 times. By adding more than one coat of polyurethane, you will ensure that your flooring is protected for years to come!